Here's a few 40th birthday poems that were written for all those who are turning the big four-O. You may want to include one of these unique verses inside a greeting card or simply send it with a nice email. It's your call. You'll notice that the first one is meant to be uplifting and/or sentimental. The 2nd and 3rd poems are both intended to be funny. 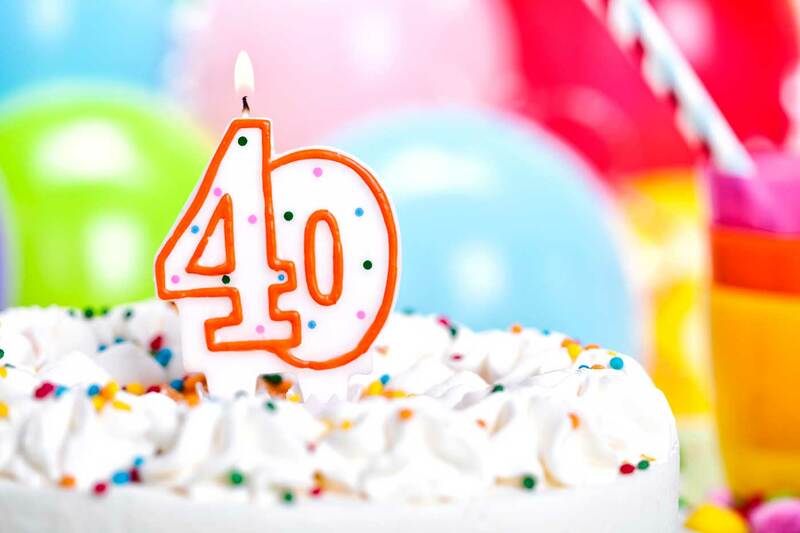 One asks the question whether, "life begins at 40? ", while the other one makes fun of aging (or at least the early signs of it). The last two poems include one for women who are turning forty, and there's one for men as well. I hope you find one that you like, and may it bring a big smile to that 40 year old you share it with. The first one is dedicated to Richard Coope, who has turned 40 today. at your forty great years. at least forty sweet cheers. may you take them with stride. and your heart remains light. since it's special and rare. Alright, so that was meant to be a sweet and sentimental poem. The next one is very light-hearted. It asks the question whether life begins at 40. I'm sure you have heard. the day we are born. much more you can handle. it begins each new day. and you're willing to play. Does life begin at forty? Here's a funny 40th birthday poem that you may share with your loved ones. It basically makes fun of turning forty. you are welcome to choose. to replace a few gears. the old age of youth. it's not what you feel. there's no way to heal. by that look in your eyes. the minute 40 you turn. My older sister will be turning forty in a few years, and I'm sure the above poem will make her laugh. Actually, my brother-in-law will turn forty first, so maybe I'll just save it for him. If you're younger, one of your parents may be turning forty soon. I think it could make any mom or dad laugh. Since all women love chocolate, I decided to incorporate a chocolate theme into this 40th birthday poem for women. about the size of your waist. you are encouraged to choose. a buy some nice shoes. and you're looking quite fine. So if you decide to share this poem with a lady that is turning forty, make sure you also include some delicious chocolates with the poem. If you're the husband or boyfriend, you may want to go with something more romantic. However, if she's a good friend of yours, than this poem is ideal. But it's still totally up to you. The next 40th birthday poem may be shared with all those men who are turning forty out there. It compares their current state with their youth and it's meant to be more on the humorous side. and it's time to compare. now go grab a chair. does not want to grow. it's not in your mind. But no need to compare. That was a short verse that any forty year old guy would laugh at. Maybe I should add a stanza about beer to it? What do you think? Here's another section where you'll find a 40th birthday invitation poem. If you scroll down, it's the second last poem on that page. Enjoy! Well, I hope you enjoyed reading these 40th birthday poems. Now go out there and share it with that 40 year old in your life (and put a smile on his or her face).